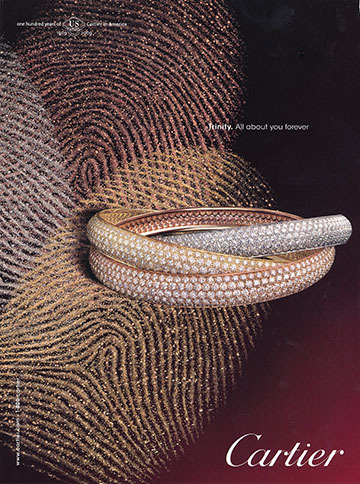 Cartier releases the trinity collection paved in diamonds and gemstones for the one hundred year celebration of Cartier’s opening the first flagship store in New York City.Three colors of intertwined gold , the trinity rings and bracelets are a classic Cartier design. Photographed with sparkly thumb prints in white, rose and yellow glitter the bracelets and rings are called “Trinity, All about you forever”. This photograph is in keeping with what France’s famous poet, Jean Cocteau, wrote about Cartier’s beautiful work “a cunning magician, who can capture scraps of moonlight against a gold thread of sunlight”. Jean Cocteau was one of the first artists to commission Cartier to make an academicians’ sword. 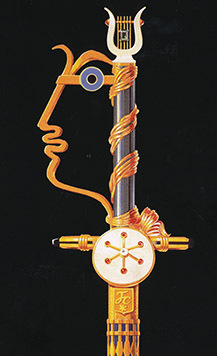 In 1955 the poet drew a design for the sword based on his theme of Orpheus. The profile of Orpheus is outlined from the handle which at the top is surmounted by a lyre inset with 2.84 carat emerald. The emerald was a gift from Jean Cocteau’s friend and admirer Coco Chanel. On the ivory disc is a six pointed star with a cabochon ruby at each point. The diamond in the center of the star was given to him by Francine Weisweller. 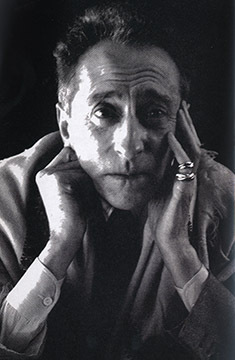 The Orpheus theme was very important in Jean Cocteau’s work and Cocteau was to have an influence on the production of the movie at a later date. Louis Cartier became great friends with Jean Cocteau and of course appreciated his beautiful writings. The trinity collection was born when Louis Cartier created a magnificent ring for Jean Cocteau which consisted of three bands of gold. Each band in a different symbolic color; grey for friendship, yellow for constancy and pink for love. Jean Cocteau wore this ring on his small finger for the rest of his life. 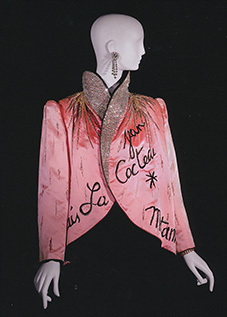 Yves Saint-Laurent also paid homage to Jean Cocteau, France’s beloved poet. Tributes to Jean Cocteau by Cartier and Yves Saint Laurent in gratitude of his gift to us in poetry and music created original art in perfection, the Trinity Collection and the Evening Ensemble Great Coat.